This afternoon, my daughter and I visited the local Veteran’s cemetery. I started a tradition three years ago, where we go and place a penny on the tombstones and thank the service member for his/her service. It was nice to see quite a few people at the cemetery today. It was sad that hardly anyone was leaving coins this year. There were quite a few last year. My daughter is in charge of selecting the graves. I read the name, rank, branch and any war listed. She then will thank them. This year we found two from the Gulf War and Iraq. I do ok with Korea, WW I and WW II. The newer wars always stop me in my tracks. This year, there was a soldier who was born in 1988. He was just a few years older than my son (who is currently serving). I always need to pause at these graves. On the other hand, we did “meet” a Chief, Colonel and a Lt. Colonel. We did have one elderly man stand a few feet away and watch us. I looked back and he was nodding his head, ever so slightly, in approval. I continued to observe this man, as he searched the headstones with a purpose. When he found the one he was looking for, he got down on one knee, placed his hand on the tombstone, and bowed his head. Then I saw him last down next to the grave. I am not sure who was buried there, but he obviously meant a lot to that man. We finished up our visit, reaching 75 graves, instead of our usual 50. Another year to reflect on the cost of freedom. This is very touching. My family and I were at our Veterans Cemetery as well, your post touched close to home as one of the graves we visited was my husband’s friend, born in 1988 and died in 2010. I didn’t get a chance to know him, but just seeing the shortness of his life, it’s just heart breaking. What you and your daughter do is a wonderful thing. Thank you for your kind words. We are just doing our little part. I know my daughter wasn’t as excited as she was the first couple years, but this is such an important lesson in respect, she will learn to accept this tradition and years from now, when she can see the value, she will have many memories of her visits to these fallen warriors. What that elderly man did is so heartbreaking. He lost someone who meant so much to him. I agree. 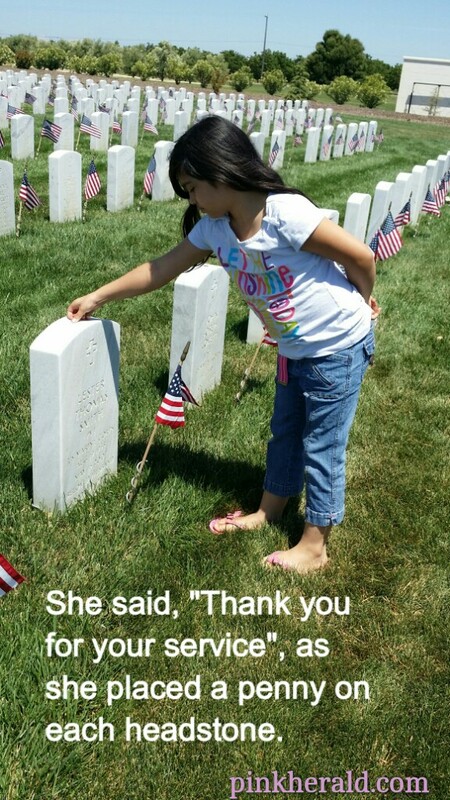 I originally started this tradition to make sure my daughter understood sacrifice, history and honor. Every year, I learn something new. Every year, I am touched on an emotional level. It’s emotional but I don’t plan on stopping this any time soon.